Shoes are the finishing touch to any good outfit. But when you are a teacher, you want form and function too, right? Whether you are teaching five-year-old kindergartners or 15-year-old freshmen, you need a good shoe that does it all. This includes keeping your toes toasty on crisp fall mornings and comfy during a long day of teaching. We believe these shoes make the grade. 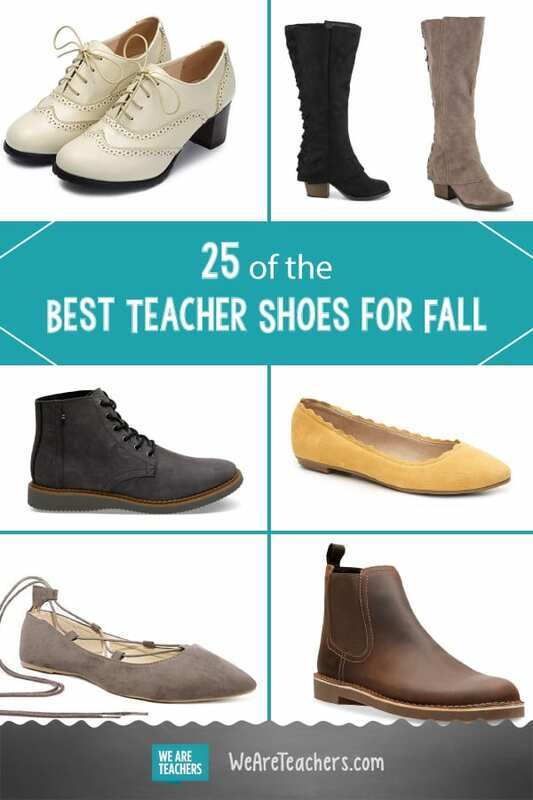 Take a look at our best fall shoe recommendations for teachers. If the ever-classy combo of tunic, tights, and boots is your go-to outfit, why not spice up your boots a bit? These suede boots look cute from any angle—even the back! Ballet flats can easily be a three-season shoe, but the soft gray color of these ballet flats make this them a decidedly autumnal shoe. The ankle lace-up is the perfect finishing touch! Pairs well cropped pants, skinny-leg trousers, and even skirts. Just like last year, ankle booties continue to be popular this season. These Goya ankle booties give you height without sacrificing comfort, thanks to the wedge heel. Who says you can’t wear bright colors in the fall? Although these boat moccasins are bright, the cozy suede material says fall. Pair these with black leggings, a black tunic, and complimentary scarf, and you’ll be a fashion icon. Bonus: Those thick rubber soles are going to keep you from slip-sliding on rainy fall days. Sperry is known for its boat shoes, but let’s try something new this year: wool sneakers. The casual attitude of sneakers but the warm coziness of wool? Yes, please! Sport these breathable shoes in a classic fall color, like burgundy. How adorable are these? This wedge heel can add height without the pain of a traditional high heel, which means they not only look cute but your feet won’t rebel either. The cozy sweater top of these booties would make them look super cute with a knit dress and blanket scarf. Just add a pumpkin spice latte. Another fall staple that comes in an array of color choices. Choose a neutral shoe and make your outfit pop or choose a bright shoe and opt for a neutral outfit. With so many color options, there is a boot for every outfit. Bonus: Since they’re Hush Puppies, your feet will thank you all season long. Every fall wardrobe needs a black ankle boot, and this is it. Dansko shoes have a reputation for being comfortable, so that’s a huge win in our book! Choose from black leather or black suede. These aren’t your mother’s saddle shoes, and they aren’t your father’s oxfords. These are like a magical combination of both, with a modern flair. We’re pretty sure they would look darling with ANYTHING. Maybe even sweatpants. Maybe especially sweatpants. Yes. More oxfords. Nothing says “I’m an academic, and also it’s fall” quite like a pair of oxfords. The platform and sturdy heel are going to make these saucy little things easy to stand in for long periods of time, and you still get the benefit of wearing a heel. Yes, of course UGG had to make the list! UGGs are comfort manifested in a shoe, and these Gracen boots bring a little bit of class to your feet. This taupe is the color of the season. As much as we love a frigidly cold fall day, we’re aware that not everyone lives in a state where fall equals chilly. If you fall into that category, you can keep your feet cool yet still be festive with a fall-inspired color. These aren’t your typical Mary Janes! These “seamless wedges” add comfortable height. Available in a variety of shades, these cute shoes can carry you not only through fall but well into the holiday season should you choose the deep cherry red color. Do you need arch support but don’t want to miss out on the cuteness of flats? Then these flats are for you! You can wear these bad boys on the weekend and then easily transition them to the classroom come Monday. Ergonomic footbed. That phrase is music to a teacher’s ears! The nice thing is that these don’t look like clunky, comfort-over-style shoes. And these are remarkably pretty for fall. Add some brown tights, an olive green tunic, and an ivory infinity scarf. That’s Pinterest-level fashion right there. What’s better than a pair of scrunch flats? A pair that is both black and grey. What’s even better than that? FLANNEL BLACK AND GREY SCRUNCH FLATS. Before you scroll past this Croc, note that it is not the “wash your car in these” clogs. This Mary Jane Croc is actually part of Croc’s Croc at Work line. That means thicker construction, more arch support, and footbeds with a massaging foam base. You can’t have a fall shoe list without a combat boot. This particular pair has a little bit more of a softer edge than your typical combat boots. These Chelsea-style boots are made of real leather, which means not only will they be comfortable and breathable but they will last for years. There are few things more academic than plaid. And that contrasting heel? That grey corduroy patch is the elbow patch of the shoe world. We just can’t get enough of these TOMS. You might not want to wear your full-out gym shoes to school, but if you need a good fall walking shoe (think: field trips to the orchard), this is your go-to. We hear you: Sometimes those riding boots are oh-so-tight on your calves, but not these! These are extra-wide so your legs fit comfortably into this riding boots. We’re not sure which part we like most, the lace-up back or the hooded bottom. Yes, another TOMS, but this one is water resistant and winterized. This classy boot can hold up to long days, tough weather, and long commutes to school. So they are functional and stylish. Yellow is often described as a happy color, and as soon as you shift to a yellow mustard shoe, you are totally in fall territory. We especially love the scalloped edge of these shoes. The round toe and nubuck leather help make this shoe a form-fitting shoe, which means this shoe adapts to you. The band around the top is elastic so these shoes are easy to slip on, but they won’t fall off while you are wearing them. 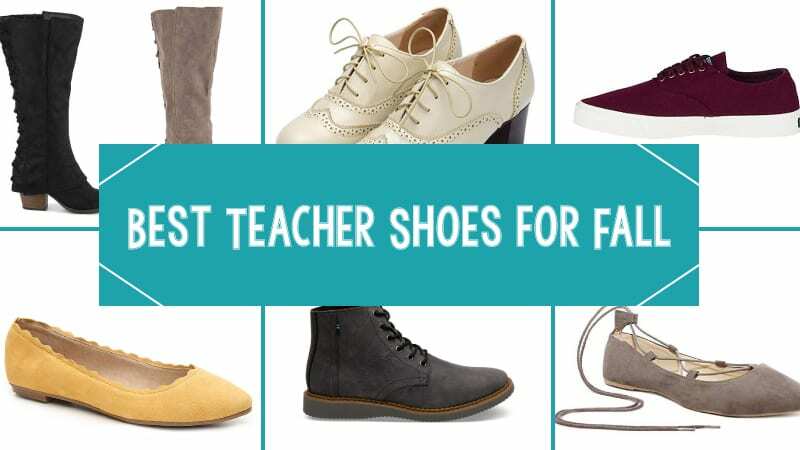 What are your favorite shoes to wear while teaching? Come share in our WeAreTeachers HELPLINE group on Facebook. Plus, check out our favorite teacher bags.